And the rockets' red glare, the bombs bursting in air. Cue music. Cue fireworks. And cue bottoms up. 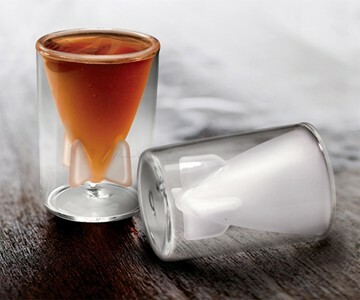 This set of two Bombs Away shot glasses arms liquor shooters with the makings of an explosively good time. Just don't overdo it, or the projectile will launch back up anywhere from 45 minutes to 5 hours after initial belly contact. Glasses fashioned from double-walled borosilicate glass have frosted, 1 1/2-ounce interiors shaped like miniature missiles. 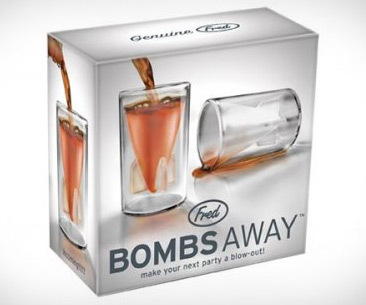 Bomb strength varies according to loaded ammo--Duck Farts land with just enough force to alert partygoers that the liquor battle has begun, while shots of Bacardi 151 guarantee no one will leave in one piece. And, as always, missile effectiveness and impact depend largely on the accuracy of the shooter's aim. Missing one's mouth...or dribbling...both constitute misfires. 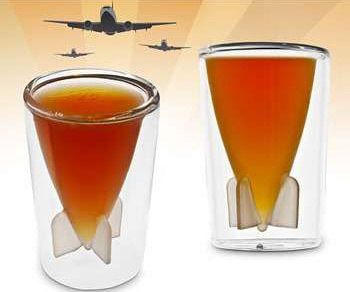 Bombs Away Shot Glasses each measure 2" x 2" x 3".